Royal Navy Frigate HMS IRON DUKE arrived in St. Vincent and the Grenadines on Tuesday, August 8, for a two-day informal port visit during her tour of duty as the UK’s permanent and tangible presence in the Caribbean. 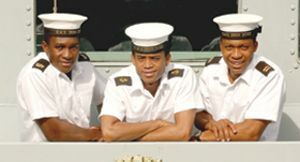 While in St. Vincent and the Grenadines, members of the Ship’s Company were to conduct basic training for the local Coast Guard Unit, predominantly in fire-fighting techniques, the use of specialist fire fighting equipment and also in electrical and mechanical maintenance. The Ship’s Company were looking forward to a relaxing break from their operational tempo and were hoping to tour both the active volcano and the movie set for the Pirates of the Caribbean. Sporting fixtures were also arranged, including football matches against the Bequia All Stars and a team from the St. Vincent Coast Guard. This visit had particular significance for three members of the Ship’s Company who are natives of the Island and left to serve in the Royal Navy. They were thoroughly looking forward to inviting their families aboard their ship during the port visit to their home country. Marine Engineer Artificer Glevan Robinson, Leading Steward Kevin Deane and Marine Engineer Mechanic Arrian Gregg were proud to be home once again. MEA Robinson joined the Royal Navy in 2005 leaving his hometown of Barrouallie where his proud parents, Clyde and Nopsy Robinson still reside. LSTD Deane, 22, from Kingstown joined the Navy in 2003, and currently has relatives in Richland Park and Akers Village. He hopes to return to St. Vincent once he has finished his Business Degree and work in the hotel business. MEM Gregg, 24, from Bequia, worked in the Customs and Excise in Bequia before joining the Navy in 2003. This is Greggs 3rd ship, others being HMS Ark Royal and HMS Illustrious. Arriving in the region at the beginning of the hurricane season, HMS IRON DUKE Ship’s Company is trained and ready in all respects to fulfil all her roles. This deployment is in stark contrast to HMS IRON DUKE’s deployment earlier in the year. which took her to the icy seas around Northern Norway, well into the Arctic Circle.